A most imaginative and rewarding programme of French music from this Swedish chamber orchestra and their British conductor. Howard Shelley is a well-known and highly respected musician as both pianist and conductor, particularly thanks to his important work with the London Mozart Players, but the Västerås Sinfonietta is much less famous. Make no mistake, the town of Västerås, located in central Sweden halfway between Örebro and Stockholm, can be proud of its resident musicians. Although Masques et Bergamasques was composed in 1918, some of the material dated from much earlier. On his own admission Fauré 'cobbled together' the music, in which he bodily transposed a number of earlier pieces to the new context. The main theme of the Ouverture, for instance, described by Reynaldo Hahn as 'Mozart imitating Fauré', was written back in 1869, while other prominent ideas include the song Clair de lune and the celebrated Pavane. As for the title, the word Masque related to the music’s commissioning, which came from Prince Albert of Monaco for 'a one act lyric divertissement'. Bergamasque derived from a line in Verlaine's poem Clair de lune. These various aspects of the score are skilfully delivered in this performance, with perfectly judged tempi and instrumental balances, and beautifully recorded, too. The same might be said also of Shelley’s performance of the celebrated Pavane. 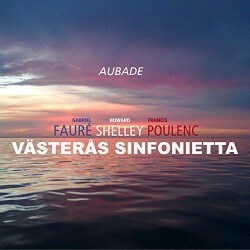 The two Poulenc items make an ideal pairing and each of these compositions ought to be better known. The Aubade is a curious piece, well described in Stellan Moberg’s booklet note as a ‘curious blend of piano concerto, ballet and chamber salon piece’. It is beautifully played and Shelley’s phrasing and shaping of the music bring out its special qualities. In 1947 the BBC commissioned Poulenc to compose a piece for the First Anniversary of the Third Programme, and the result was the Sinfonietta. Using several ideas from a discarded string quartet, he produced this ‘little symphony’, whose personality combines an easy-going rhythmic vitality with a succession of attractive flowing tunes - an ideal combination. Hearing the music in this sensitively shaped performance, it is easy to understand Poulenc's own view that it represents 'a farewell to youth; a final fling before I settle down into my musical middle-age'. Given the excellence of both the recorded sound and the various performances, it is regrettable that the artists are let down by the poor presentational standards of this CD release. For example the details of each work, including the movement headings, do not appear within the booklet but rather are listed only on the outside of the box, where they are rendered barely visible because they are printed in white against a background picture of the sea and sky at sunset. What a pity.